I get many requests from people asking how they can connect on a deeper level with their Ascended Master and Teacher. My standard response is open your heart to the Master, because when your heart is open to them they can come closer. But there is another way - The Torus connection technique. Sanat Kumara gave me this technique many years ago, around 1999 or 2000 and I teach it at nearly all my workshops. The Torus technique is easy but takes some instruction and explanation. You are a multidimensional spiritual Being having a physical experience. We forget this - we think we are a limited person in a physical body - when truly we are much much more. The torus can be a vehicle for you to explore more of your multi-dimensional Divine self. A torus is a contained and constructed unit of energy. It looks like a ring donut. It holds energy from all the dimensions and all the planes – it exists through all time and space. The energy within the Torus cannot escape outwards – it is its own “ring pass not”. It is within this contained unit, that a group can work together across all dimensions and planes in balanced vibrational harmony. Nothing can enter the torus that is not invited, so it is a safe place to talk to your Ascended Master. Here I will teach you how to create your own personal torus and a group torus with your guides and Ascended Master. Much is written about the Torus, so I leave the Maths and esoteric knowledge to those who are more eloquent than me; suffice to say it’s a very intriguing form. You are going to connect 3 aspects of yourself so they form a Torus – your Divine Mind, you Sacred Heart, and your Soul. Start with a meditative breathe – with the intention of connecting with your Ascended Master. Take your attention to your body – be aware of it – now move your awareness to the pineal gland in the centre of your head. Once there take you awareness a centimetre to ½ an inch above the pineal. This is the Divine Mind. You have just slipped from physical awareness to spiritual awareness. Sit in that space for as long as you like. It’s a good place to meditate. But for our purposes we move on, you will see a silver cord appear in the Divine mind – this will drop to the Sacred Heart. It can’t go anywhere else. So with your awareness, follow the cord to the Sacred Heart. And for those of you who went into "I don't see mode", do you get a sense of feeling heavy, go with the heavy dropping feeling - it will take you to the Sacred Heart. You might like to meditate in the Sacred Heart another time. Now become aware of another silver cord, this one from the Sacred Heart is connected to your Soul . Follow the silver cord to your Soul ( it is below where the 2 collar bones meet between the heart and throat chakras, sitting out from the physical body). You might like to meditate there at another time. And from there another silver cord connects back to the Divine Mind. So in effect you have created a Torus (a ring) of energy connecting the Divine Mind – Sacred Heart – Soul. Sit in the energy. Follow the energy flow through the 3 centres a few times. You have connected your awareness to some of your highest levels of consciousness. Everything you receive will come in at its highest potential – from the Divine Mind, Sacred Heart and Soul. Just as you have created your own Torus, the Masters all live on their own Torus – always in touch with their highest consciousness. Below is a MP3 link to hear the technique as a meditation. The voice you hear is AmayahGrace. Please note AmayahGrace says the Sacred heart is behind the physical heart, change that to above the heart chakra. Now to communicate with the Masters you are going to create another Torus with the Masters – a Group of two Torus. 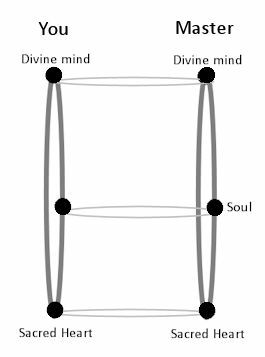 While still on your own Torus of Divine Mind, Sacred Heart and Soul ask your Ascended Master to step forward so you may connect with them on a deeper level and even communicate with them. Then seeing, feeling, knowing or just hoping they are before you - connect to your Divine Mind and see a silver cord connect to the Masters Divine Mind – move to your Sacred Heart and see a silver cord connect from your Sacred Heart to their Sacred Heart – move to your Soul and see a silver thread go from your Soul to their Soul. The Master in turn will be doing the same back to you. A group Torus of two has been created. Feel the flow of energy coming along the Masters silver cord to you, try to match the vibration. In most cases the Master will alter their vibration to make the connection more comfortable for you. But it is good to try. Again below is the technique for you to listen to. Now sit in meditation with the Master and allow the Ascended Masters energies flow into you. When you are ready, you may receive teachings or direction. But in most cases the Master will take this opportunity to give healing and work with you on higher levels. You are completely contained within the Torus and protected. Nothing else can enter the exchange that isn’t invited. 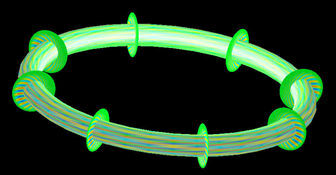 You can invite as many people as you like onto a group torus - excellent for a meditation group or healing group to use. This diagram gives a pictorial idea of how it would work - you can see the formation of the bigger torus. A unity consciousness or group consciousness forms, perfect for a group working on the same project ie earth healing, for they then work as a single unit. Make your own personal Torus. And with the permission of those in your group first send a silver cord from your divine mind to the person to your right. Everyone will be doing this at the same time and so envision a silver circle linking all the divine minds. Now repeat the procedure linking your divine mind to the person on the left. So now the connection from each person goes both ways. Now feel the connections - is the energy flowing to you and from you to the left and right in balance - if not work to correct the flow so the energies are in harmony. We want the torus to be balanced. Then follow the silver cord divine mind connections from either your left or right or both around the entire group and back to yourself. Repeat the procedure for the Sacred Heart and the Soul. Now a single divine mind, single sacred heart and single soul has been created - all these individual divine minds, sacred hearts and souls are in unity consciousness and will work more effectively as One than as many individuals. Again below is the audio of the technique, it only has half of the procedure but having read the technique above you will be able to fill in the rest yourself. Enjoy your Torus – and I suggest everyone begin each meditation with this practice – it brings a greater sense of peace and balance to the experience. This is a wonderful technique to use in mediation groups as it links everyone to become - one Divine mind, one Sacred Heart, one Soul. Meditation groups will achieve a greater level of power when linked in this way. 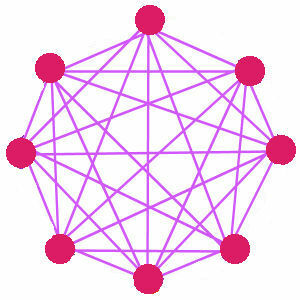 This technique is perfect for creating change - rather than a group all working as many single units on a cause, when they are united as one in this way you will see how the connection focuses the power. The key though is to be in balance energetically and in harmony as a group. The MP3 recordings for the Torus technique were recorded by AmayahGrace.